On Friday February 1st the whole College celebrated the Feast of the Presentation of The Lord. Since the foundation of our College in 2014, this has also been celebrated as our College Feast day. This is because it marks the Occasion in 2015 when Bishop Marcus came and officially opened St Bede’s and St Joseph’s Catholic College. It is also especially connected to us as the Gospel of the day also gives us our school motto, as Simeon, in St Luke’s Gospel, describes Jesus as “A light for all nations”. The students and staff from St Luke’s House led the liturgies, which involved students from across our school community. The first part of the liturgy was at Ignis, where the youngest student in the house, Ngozi Hamilton, lit a lantern from the Easter candle. 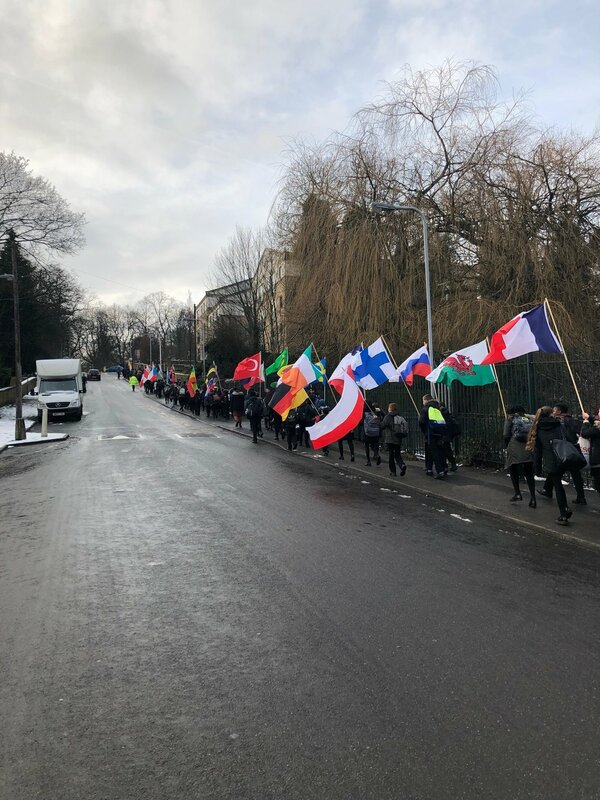 Ngozi was then joined by 180 other junior house students as she carried that light leading a procession of the flags of the nations, our College flag and the Papal flag, which brought unexpected colour to the streets of Manningham and Heaton on a Friday afternoon. At Ardor, Ngozi handed the light to the oldest student Dhana Corpuz, after in the liturgy, the light was shared with every form group, who took part in the liturgy in their House area via video link. They had a presentation from Mr Bentley on the history of our school since 1900, and also saw the start of the procession on Cunliffe Road. We concluded by the whole of our community saying our College prayer together, and every student receiving a commemorative gift. Mr C Oldcorn, Scholastica Leader.